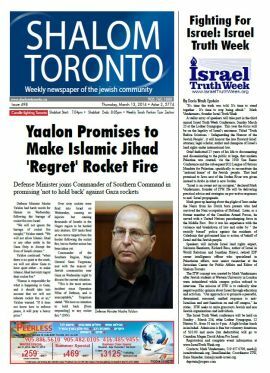 If you watch every one of the videos on this page you will, regretfully, be more informed than most journalists about the Middle East, and you will be able to better judge for yourself whether or not the allegations that Israel is an Apartheid country that stole land from Arabs are true or false, and you will gain some insight into the ugly, core obstacle to peace: rabid Jew-hate. In this concise, easy-to-understand presentation, Salomon explains the international law that led to the creation of the original two-state solution: the 1920 San Remo Resolution which was codified in the 1922 League of Nations Mandate For Palestine. He also briefly examines the claims by opponents of Israel that the Allied Powers had no authority or intent to create a Jewish home in Palestine. VIDEO A2. Israel Ministry of Foreign Affairs, Deputy Minister Danny Ayalon, July 12/11: The Truth About the West Bank [VIDEO, 6:17] Minister Ayalon explains where the terms “West Bank,” occupied territories” and “67 Borders” originated and how they are incorrectly used and applied. He also mentions the original two-state solution: the 1922 League of Nations Mandate For Palestine. VIDEO A3. Shalom TV, published July 9/12: Jerusalem Sovereignty: Gauthier [VIDEO, 51:26] International lawyer and human rights advocate, Dr. Jacques Gauthier, explains, in depth, the legal evidence proving that Israel has legal title to Judea-Samaria due to the original two-state solution created via the San Remo Resolution and its codification by the League of Nations Mandate For Palestine. He opens by explaining evidence proving that any interpretation of the 1948 armistice lines from the first Arab war against Israel as being lawful ‘borders’ is not in keeping with international law or the terms of the armistice itself. A powerful presentation with many maps and documents cited throughout. This work shows how claims about stolen land were fabricated to suit the goal of removing Jews from their reconstituted home in the Palestine Mandate area. VIDEO B1. PRAGER University, Sept 22/13: A Black South African, Israel and Apartheid [VIDEO, 5:39]. VIDEO B2. StandWithUs.com, 2013: CEO Roz Rothstein interviews South African MP Rev. 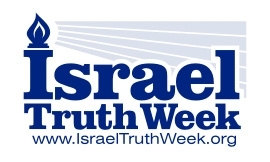 Dr. Kenneth Meshoe about false accusations that Israel practices apartheid [VIDEO, 20:33]. 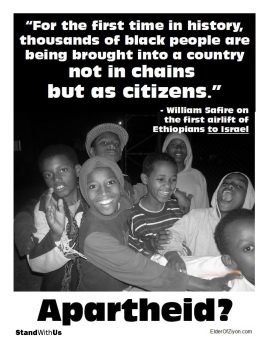 “As a black South African who lived under apartheid…In my view, Israel cannot be compared to apartheid in South Africa. Those who make the accusation expose their ignorance of what apartheid really is.” San Francisco Examiner, Rev. Kenneth Meshoe, May 15, 2013: Pro-Palestinian ads misrepresent apartheid. Black South African Member of Parliament, Reverend Dr. Kenneth Meshoe, exposes the lie of Israeli ‘apartheid’ and how it dishonours the memory of the real apartheid that he and his family experienced. VIDEO B3. BlogWrath.com/Miroslav Marinov, Nov 19/13: StandWithUs Canada presentation of Rev. Kenneth Meshoe on why South Africa was an apartheid state and Israel is not [VIDEO, 24:47]. Kenneth Meshoe in Toronto, Nov 19/13. Photo: Miroslav Marinov/Blogwrath.com. Click for video. 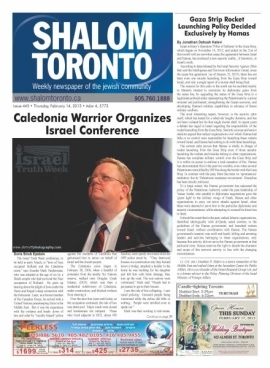 Canadian Jewish News, Nov 26/13: South African MP refutes Israeli Apartheid lie. VIDEO C1. Israel Ministry of Foreign Affairs, Deputy Minister Danny Ayalon, Sep 12/11: The Truth About The Peace Process [VIDEO, 5:59] Minister Ayalon exposes the myth that Israel’s capture of the West Bank in 1967 is responsible for Arab hostility and terror against Israel’s people as he points out, among many key facts, that the Palestinian Liberation Organization (PLO) was created in 1964 at a time Jordan was illegally occupying the Jewish homeland of Judea and Samaria it renamed to ‘West Bank.’ He also outlines the failed history of the various, new two-state solutions for peace since the original two-state solution was endorsed — and then ignored — by the world community in 1922: the League of Nations Mandate For Palestine. Minister Ayalon explains where all the Arab-Palestinian refugees really came from, and points out how the UN has been an obstacle to helping settle them. Ridgley’s ground-breaking documentaries highlight Jewish culture on land in the cradle of Jewish civilization where the Jewish nation was born thousands of years ago, and where the world community specifically authorized and encouraged, via the 1922 League Of Nations Mandate For Palestine, that the Jews should reconstitute their “‘national home.” Meet the residents of communities who are part of this amazing and successful struggle to revive Jewish life in Judea and Samaria. VIDEO F1. Jerusalem Center for Public Affairs, May 2011: Israel’s Critical Security Needs for a Viable Peace [VIDEO, 5:27] The JCPA shows how frighteningly vulnerable Israel is without Judea & Samaria as a buffer to protect her from invaders who have a history of trying to destroy her. As you watch the next set of videos highlighting the glorification of terror and genocide against Jews, you might wonder if there is a difference between the philosophies of Mahmoud Abbas, head of the Palestinian Authority and Fatah, and that of Hamas, the terror organization that has sent thousands of rockets against Israeli civilians. The Hamas Charter was condemned by UN Human Rights Council on July 6/06 for its rejection of peace and its calls for the extermination of Jews and their state. To that end, Hamas trains its children to hate Jews and has fired thousands of rockets into Israeli civilian targets since Israel’s 2005 unilateral withdrawal from Gaza in a tragically-failed effort to promote peace. 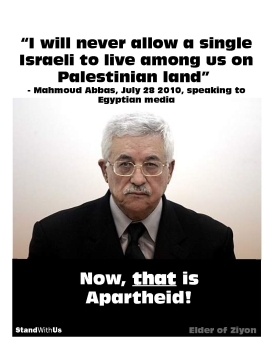 Fatah was founded by Yasser Arafat in 1959 who also later served as the Chairman of the terrorist Palestine Liberation Organization which was founded in 1964…three years before Israel had recaptured Judea & Samaria from its illegal occupation by Jordan. The cause of anti-Israel hatred, therefore, has nothing to do with Israel’s presence in Judea & Samaria. It was the PLO’s Black September faction that murdered 11 Israeli athletes during the 1972 Olympic games. The Fatah flag, which includes the images of rifles and a grenade superimposed on a map of Israel — in its entirety — shows that the goal is not the ‘liberation’ of Arab areas in Judea & Samaria, but the complete elimination of the Jewish state. On April 23, 2014 the Palestinian Authority/Fatah and Hamas organization in Gaza — signed an agreement to form an Arab-Palestinian unity government. There is no ideological difference between the groups when it comes to their mutual goal: the elimination of the Jewish state. Palestinian Media Watch (PMW) provides an English translation of the casual, but chilling words of Palestinian terrorist Ahlam Tamimi who was released from an Israeli jail in October 2011 as part of the prisoner exchange for the Hamas-kidnapped IDF soldier Gilad Shalit. Tamimi was involved in an August 09/01 terror attack at a pizza restaurant during which 15 people died including children. In this translated Palestinian TV broadcast from Oct 23/11 she explains how she carried out the ‘martyrdom-seeking operation,’ smiling broadly when the interviewer tells her she helped kill 8 children, not 3. PMW’s YouTube channel has thousands of translated videos and other Palestinian Authority material showing how the PA incites and glorifies terror, vilification of Jews, and destruction of Israel. The incitement and glorification of violence by official Arab-Palestinian sources show that the real obstacle to peace is not Israel, but rather the genocidal, supremacist anti-Semitism that is inculcated in the Arab people by their leaders. Many other translated videos of can be found on the MEMRI YouTube channel. VIDEO G3. (HAMAS TO JEWS: LEAVE OR BE KILLED) — Palestinian Media Watch (Palwatch.org): Translation of Al-Aqsa TV (Hamas in Gaza) broadcast of May 5/14 cartoon/song, ‘The End Of The Hatikvah,’ sung to the tune of Israel’s national anthem (Hatikvah — ‘the hope’). [VIDEO, 1:56] This animated cartoon and its song vilifies Jews and celebrates: destruction of their temple and murder of Israeli leaders; conversion of the Western Wailing Wall into Arab housing; and the eventual expulsion of Jews who will leave or be killed. Thousands of other translated videos can be found on the Palestinian Media Watch YouTube channel. VIDEO G4. (HAMAS TEACHES CHILDREN TO SHOOT ALL THE JEWS) — Palestinian Media Watch (Palwatch.org): Translation of Al-Aqsa TV (Hamas in Gaza) broadcast of May 2/14 children’s show. [VIDEO, 1:28] This Hamas children’s program — which is hardly unique or rare — glorifies the shooting of Jews, and demonstrates the near-impossibility of achieving peace of any kind due to the inculcation of hate in Arab children. Thousands of other translated videos, including those targeted at Arab children, can be found on the Palestinian Media Watch YouTube channel. The history of the Arab-Palestinian movement and its despicable cooperation with the Nazis’ plan to exterminate Jews. In just over two minutes, the author of the stunning book Son Of Hamas explains what Hamas is all about and why there can never be peace between Israel and Hamas and, indeed, the world.